What a historic day, September 11, 2010, was - the birth of Quaker Hill Rampage 0A36 on the legendary Quaker Hill Farm near Louisa, Virginia. The story begins over 160 years ago with the birth of Lady Craigo, Reg. #689, born in the mother church of Angus cattle, the country of Scotland, under the ownership of Mr. Carnegie, the owner of the Craigo herd. From this very modest beginning the dynasty was to be built which would lead us to Quaker Hill Rampage 0A36 and the Quaker Hill Blackcaps. The maternal strength of the Quaker Hill Rampage 0A36 pedigree is extremely deep and strong but few people are privileged to know the history behind this epic sire and the Quaker Hill Blackcap family that has taken the Angus world by storm. The descendants of Lady Craigo, Reg. #689, excel in the W.A. McHenry herd at Denison, Iowa, and the Rosemere herd at Maquoketa, Iowa. 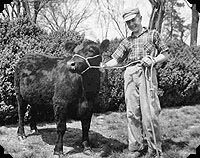 The Blackcaps were nearly lost in history in the late 40's when a Virginia farmer who had fallen on hard times offered his precious Blackcap cow along with three other Angus heifers to settle a bad feed debt that had occurred on his poultry flock. 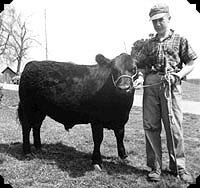 The set of Angus heifers went on to become the foundation nucleous of the Sunny Slope Angus herd for brothers Charles and Bill Wampler of Dayton, Virginia. The next 60 years the Wampler brothers were pioneers and innovators in both the Angus and poultry businesses and became legends in the field of agriculture not only in Virginia but the entire nation. Under the watchful supervision of the Wampler brothers the herd continued to grow and expand. They were one of the original poultry integrators owning Wampler-Longacre Chickens and Turkey, a well-respected brand in the eastern part of the United States. 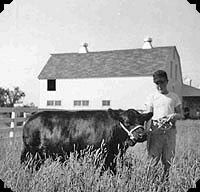 They treated and managed their Angus herd just like their poultry, relying on science and technology to lead the way. They were one of the founding members of the Virginia Beef Cattle Improvement Association and were leaders in on the farm testing and measuring their Angus cattle. The Wamplers helped found the three BCIA Central Bull Test Stations in Virginia to help sell and promote the improvement of beef breeding stock for Virginia and the surrounding states. They practiced rigid culling and continued to refine the powerful Blackcap family. In the late 1990's the Wampler Brothers decided to slow down and take a well-deserved break planning what would have been a historic retirement dispersal. While a dispersal could have been financially rewarding, they grew concerned about not continuing the work that they had started with this fine cowherd. The Wamplers made the decision to entrust the herd into the hands of the Rosson family at Quaker Hill Farm. Charles and Lee Rosson, along with their father Charles S., continued to carry the herd to new heights. Quaker Hill Rampage 0A36 and the Quaker Hill Blackcaps broke onto the national scene with the evolution of DNA sequencing and the 50K test. It was the game changing moment that allowed the Angus Family around the world to see what the Wampler brothers and the Rosson Family have known for decades, that these cattle cover all the bases. The genomic test had validated what years of careful selection and breeding had been responsible for. From that point on it has been a wild ride for this 6th generation farm family from Louisa, Virginia. The dam of Quaker Hill Rampage 0A36, QHF Blackcap 6E2 of4V16 4355, quickly became the "MOTHER OF AI HERD BULLS" as she has placed nine direct sons in major AI Studs, A RECORD UNEQUALLED, such great bulls as Quaker Hill Rampage, Quaker Hill Firestorm, Quaker Hill Wide Stride, Quaker Hill Inside Track, Quaker Hill Conviction, Quaker Hill Assurance, and Cogent's Quaker Hill Like No Other. She broke Quaker Hill sale history selling for $150,000 to the Cox Ranches in Texas. QHF Blackcap 6E2 of4V16 4355 has a great production record with three calves with a weaning index of 109 and three calves with a yearling index of 114. Quaker Hill Rampage 0A36's grandam, QHF Blackcap 4V16 of 1H8, sold for $75,000 to Prospect Hill in New York as a yearling heifer and proved to be a sensational producer. The third dam, Quaker Hill Blackcap 1H8 sold as a mature cow to Craigmore Farm in Canada for $100,000 with a production record of six weaned calves at a ratio of 119 and four yearlings at 115 and was in production until she was 17 years of age! Quaker Hill Rampage 0A36's fourth dam, Quaker Hill Blackcap W940, was in production at Quaker Hill until she was 16 years of age and she recorded seven calves with a weaning index of 111 and seven calves with a yearling index 111. Quaker Hill Rampage 0A36's fifth dam, Wampler Blackcap Shen W111 produced eleven calves with a weaning index of 103 and ten calves with a yearling index of 105. Genuine Cow Power in the Quaker Hill Blackcaps. The Quaker Hill Blackcap story continues. Daughters of QHF Blackcap 6E2 of4V16 4355 and sisters of Quaker Hill Rampage are making indelible records. Quaker Hill Blackcap 0A32 who recently sold for $500,000 for Spring Grove Ranch in Lynchburg, Virginia, to the High Roller herd in Texas. Like her dam, Quaker Hill Blackcap 0A32, is writing history as well, having four sons in major AI bull studs including Quaker Hill Manning at Select Sires, Quaker Hill Dead Center at Cogent, Quaker Hill Mile High at Alta Genetics, and her latest son by Game Changer is headed to Semex. Quaker Hill Blackcap 0A38 another daughter and sister to Rampage sold for a $150,000 in the National Angus Finals Sale in 2015 in Las Vegas to Five Peppers and the Decades of Excellence breeders in Tennessee. Robin Toms from Staunton, Virginia, was an early partner in QHF Blackcap 6E2 of4V16 4355 and enjoyed tremendous prosperity through his involvement with the Quaker Hill Blackcaps and the Rosson family. He had the privilege and pleasure of selling females as high as $40,000 out of the great cow and many outstanding sons to reputable herds. He has built a great cow herd around Rampage's dam. This is just touching the tip of the iceberg on the success of the Quaker Hill Blackcap family. The best is yet to come. As Charles Rosson says, "The first time I saw the Wampler cow herd I was literally amazed. They were extremely big bodied cows with lots of rib, perfect udders, good feet and plenty of muscle but yet super feminine. The cows were nursing calves the day we went to look at the cows with Bill Wampler. I can vividly remember these big, soggy cows with milk just streaming out of their udders. Every calf that looked up from nursing had a white soggy face saturated in milk!" These are the words of Charles Rosson as he recalled the purchase of the herd. As Charles likes to say, "It was definitely God's grace shining on us that day, what a blessing it has been to own these great cows." 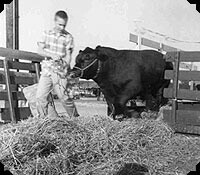 As you study the pedigree of Quaker Hill Rampage 0A36 every bull on the top side of his pedigree, MCC Daybreak, Boyd New Day 8005, AAR New Trend and SAF Focus of ER were in a major AI studs. The dam, QHF Blackcap 6E2 of4V16 4355, was sired by a great bull that was bred in the Jorgensen herd at Ideal, South Dakota, and he in turn is by SS Objective T510 0T26, a bull bred in the Phil Abrahamson herd in Minnesota and a breed leader for registrations in 2010 with 8,402 progeny recorded. As you study the Quaker Hill Blackcap family, one is quick to realize the power of the blood and the influence of the Rosemere herd which was founded by the late Otto Battles in 1898 in Denison, Iowa. 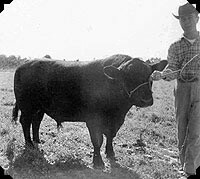 He served as president of the American Angus Association in 1920 to 1934 and was the first American to judge Aberdeen Angus at the first show in Perth Show in Scotland in 1930 and the Palermo Angus Show in Argentina in 1943. He judged the Angus Show at the 1948 International Livestock Show, was inducted into the Saddle and Sirloin Portrait Gallery in 1930 and was inducted into the National Heritage Foundation in 1983. As you further analyze the lower side of the pedigree you find the influence of the WA McHenry herd which was founded in 1887 at Denison, Iowa, the birth place of Earl Marshall. 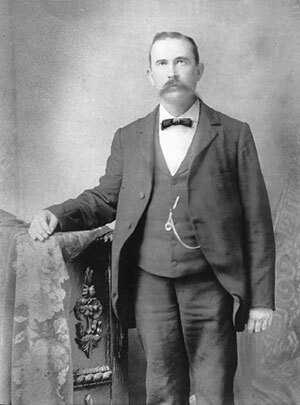 Mr. McHenry was president of the American Angus Association in 1881, 1882 and 1883 and was inducted into the American Angus Heritage Foundation in 1983. The story of Quaker Hill Rampage 0A36 and the Quaker Hill Blackcaps is one of the most exciting in the 143 year history of the Angus breed that Angus cattle have been in the United States of America. The best news is THE BEST IS YET TO COME. The progeny of Quaker Hill Rampage 0A36 continues to top sale after sale. In 2016, in the days of scientific Angus cattle breeding, Quaker Hill Rampage 0A36 hits all the markers, calving ease, weaning, yearling, carcass and $Beef. Quaker Hill Rampage 0A36 began a new chapter in his life when he was leased to the ABS Stud at DeForest, Wisconsin, and in 2016 an interest in Quaker Hill Rampage 0A36 was purchased by Jim Powell for his Powell Farms herd in Limestone, Tennessee. Quaker Hill Rampage 0A36 and the Quaker Hill Blackcaps are truly legendary in the Aberdeen Angus breed and the beef cattle industry. The most exciting and best news - THE BEST IS YET TO COME.